Here at the Swift Agency, one guy who can only dream of interviewing the Enchantress, we know we’d botch the whole thing. I would start asking her yabba dabba and then just ran away to hide in a corner. I only seem articulate when I write because I have these nifty delete key. 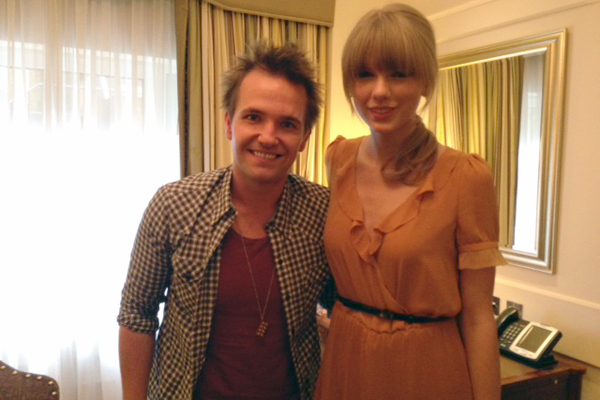 Luckily, T-Swizzle always shines on radio interviews. Smallszy from the NovaFM Radio show Smallszy’s Surgery, dropped in on the Sparkly Dressed for a chat at her hotel. She also stepped outside for a bit to visit Kiss FM. Let’s go to the video! Thank you to SmilesForTaylor for posting and a big shoutout to Thomas for the NovaFM links! The Agency members have started tweeting back from US soil. That doesn’t quite tell us where the Sparkly Dressed will be the next few days, but don’t worry. She’s bound to run into fans whenever she goes and she’s never been shy about giving them a picture if she can spare the time. Previous Previous post: T-Swizzle rocks out with her bad self at the Universal Music BRIT Awards party!